Bust of Thucydides residing in the Royal Ontario Museum, Toronto. Thucydides (circa 460 BC – c. 400 BC), Greek Θουκυδίδης, Thoukudídēs) was an ancient Greek historian, and the author of the History of the Peloponnesian War, which recounts the 5th century BC war between Sparta and Athens to the year 411 BCE. This is widely considered the first work of scientific history, describing the human world as produced by men acting from ordinary motives, without the intervention of the gods. 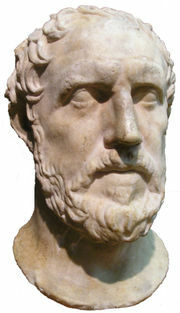 Thucydides, born in Alimos, was connected through family to the Athenian statesman and general Miltiades, and his son Cimon, leaders of the old aristocracy supplanted by the Radical Democrats. Thucydides lived between his two homes, in Athens and in Thrace. His family's connections brought him into contact with the very men who were shaping the history he wrote about. Brasidas, aware of Thucydides' presence on Thasos and his influence with the people of Amphipolis and afraid of help arriving by sea, acted quickly to offer moderate terms to the Amphipolitans for their surrender, which they accepted. Thus when Thucydides arrived, Amphipolis was already under Spartan control7 (see Battle of Amphipolis). Using his status as an exile from Athens to travel freely among the Peloponnesian allies, he was able to view the war from the perspective of both sides. During this time, he conducted important research for his history. The abrupt end of his narrative, which breaks off in the middle of the year 411 BC, has traditionally been interpreted as indicating that he died while writing the book, though other explanations have been put forward. Although there is no certain evidence to prove it, the rhetorical character of his narrative suggests that Thucydides was at least familiar with the teachings of the Sophists. These men were traveling lecturers, who frequented Athens and other Greek cities. It has also been asserted that Thucydides' strict focus on cause and effect, his fastidious devotion to observable phenomena to the exclusion of other factors and his austere prose style were influenced by the methods and thinking of early medical writers such as Hippocrates of Kos. Some have gone so far as to assert that Thucydides had some medical training. Both of these theories are inferences from the perceived character of Thucydides' History. While neither can be categorically rejected, there is no firm evidence for either. Inferences about Thucydides' character can only be drawn (with due caution) from his book. Occasionally throughout "The History of the Peloponnesian War" his sardonic sense of humor is hinted at, such as during the Athenian plague (Book II), when he remarks that some old Athenians seemed to remember a rhyme that said with the Dorian War would come a "great death." Some claimed the rhyme was actually about a "great dearth" (limos), and was only remembered as "death" (loimos) due to the current plague. Thucydides then remarks that, should another Dorian War come, this time attended with a great dearth, the rhyme will be remembered as "dearth," and any mention of "death" forgotten. Thucydides admired Pericles and approved of his power over the people, though he detested the more pandering demagogues who followed him. Thucydides did not approve of the radical democracy Pericles ushered in but thought that it was acceptable when in the hands of a good leader. Although Thucydides has sometimes been misrepresented as a cold chronicler of events, strong passions occasionally break through in his writing, for example in his scathing appraisals of demagogues such as Cleon and Hyperbolus. And Thucydides was clearly moved by the suffering inherent in war, and concerned about the excesses to which human nature is apt to resort in such circumstances. For example, this is evident from his analysis of the atrocities committed during civil conflict on Corcyra in Book 3, Chapters 82-83, which includes the memorable phrase "War is a violent teacher". Thucydides wrote only one book; its modern title is the History of the Peloponnesian War. (A more accurate title, in that it reflects the opening sentence of the work, would be "The War Between the Peloponnesians and Athenians".) All his legacy to history and historiography is contained in this one dense history of the 27-year war between Athens and its allies and Sparta and its allies. The history breaks off near the end of the 21st year. Thucydides is generally regarded as one of the first true historians. Unlike his predecessor Herodotus (often called "the father of history"), who included rumors and references to myths and the gods in his writing, Thucydides assiduously consulted written documents and interviewed participants in the events that he records. Certainly he held unconscious biases — for example, to modern eyes he seems to underestimate the importance of Persian intervention — but Thucydides was the first historian who seems to have attempted complete objectivity. By his acknowledgement of historic causation, he created the first scientific approach to history. The whole earth is the sepulchre of famous men; they are honoured not only by columns and inscriptions in their own land, but in foreign nations on memorials graven not on stone but in the hearts and minds of men. Though many lay unburied, birds and beasts would not touch them, or died after tasting them. ... The bodies of dying men lay one upon another, and half-dead creatures reeled about the streets and gathered round all the fountains in their longing for water. The sacred places also in which they had quartered themselves were full of corpses of persons that had died there, just as they were; for as the disaster passed all bounds, men, not knowing what was to become of them, became utterly careless of everything, whether sacred or profane. All the burial rites before in use were entirely upset, and they buried the bodies as best they could. Many from want of the proper appliances, through so many of their friends having died already, had recourse to the most shameless sepultures: sometimes getting the start of those who had raised a pile, they threw their own dead body upon the stranger's pyre and ignited it; sometimes they tossed the corpse which they were carrying on the top of another that was burning, and so went off. Classical scholar Jacqueline de Romilly first pointed out, just after the second world war, that one of Thucydides' central themes was the ethic of Athenian imperialism. Her analysis put his history in the context of Greek thought on the topic of international politics. Since her fundamental study, many scholars have studied the theme of power politics, i.e. realpolitik, in Thucydides' history. On the other hand, some authors, including Richard Ned Lebow, reject the common perception of Thucydides as a historian of naked real-politik. They argue that actors on the world stage who had read his work would all have been put on notice that someone would be scrutinizing their actions with a reporter's dispassion, rather than the mythmaker's and poet's compassion and thus consciously or unconsciously participating in the writing of it. His Melian dialogue is a lesson to reporters and to those who believe one's leaders are always acting with perfect integrity on the world stage. It can also be interpreted as evidence of the moral decay of Athens from the shining city on the hill Pericles described in the Funeral Oration to a power-mad tyrant over other cities. Thucydides does not take the time to discuss the arts, literature or society in which the book is set and in which Thucydides himself grew up. Thucydides was writing about an event and not a period and as such took lengths not to discuss anything which he considered unrelated. In 1991, the BBC broadcast a new version of John Barton's 'The War that Never Ends', which had first been performed on stage in the 1960s. This adapts Thucydides' text, together with short sections from Plato's dialogues. More information about it can be found on the Internet Movie Data Base at http://www.imdb.com/title/tt0103235/.